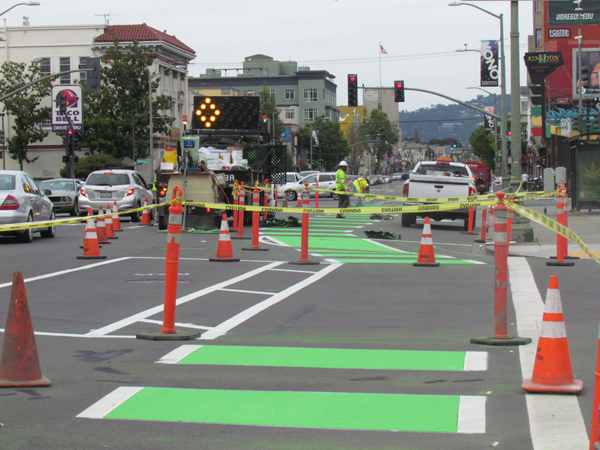 Telegraph Avenue in Oakland is finally getting its long-awaited separated bike lanes. 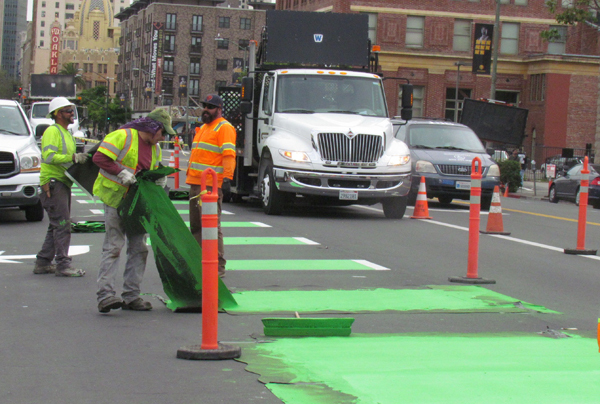 Crews were out adding the first touches of green paint. In the next week or so, they will continue painting the section of Telegraph between 21st and 27th, Oakland’s first experiment with parking-separated bike lanes. Bike East Bay will have ambassadors on the street starting next week to greet people and help them figure out the new parking configuration, which will be a foreign concept to many. Instead of parking along the curb, cars will be parked to the left of the new bike lane, which could take some getting used to. The lane markings are extended in some spots through the intersection. The bike lane will continue through the bus stops, with a buffer to the left for passing when safe. The box below the word “bus” in the photo above will be painted green. The white car on the right is parked in what will become the bike lane; you can see parking marked to the left of the buffer there. Indeed. 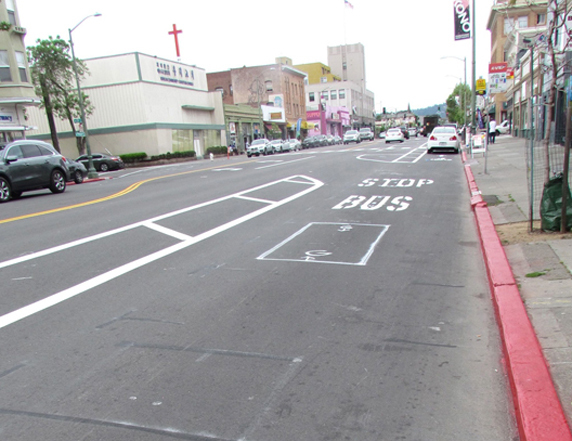 The new lanes will take about a week or so to finish, according to the city of Oakland. So exciting, I can’t wait until it’s done! The protected bikeway segment is from 20th to 29th Streets, by the way, not 21st to 27th. Buffered, non-protected bike lanes are also being implemented south of there from 20th to 16th, and additional bikeway are coming soon to Clay Street to complete a connection between Telegraph and Jack London Square. Telegraph is already much nicer to walk along, with traffic following sedately in a single line (northbound only yesterday). Meanwhile, there will be no photo opp today for the thousands or millions of potholes and crumbling blocks of pavement in Oakland streets. Seriously. On Telegraph between 40th and 51st at this very moment there are two giant sinkholes big enough to destroy a bicycle, dismount a motorcyclist, or bend a car’s wheel. I thought the city would have learned more from having to pay out millions in claims from recent road injury lawsuits. We also have a new bike lane striped on Broadway between Caldecott Field and College Prep. The lane was created by painting the gutter, which is 2 inches deep in gravel and broken glass. Do you know if the city plans to ever sweep that? Does the city of Oakland even own a street sweeper? They are putting up a major bond in November to do road work. Vote for it! How about instead of floating bonds, a Bay Area-wide tax on driving or gasoline or both? And tie it to the weight of the vehicle using the streets. They don’t need a bond, they need someone to issue an enormous fine to the utility company that dug the holes and filled them two feet deep with tar. Edited to add: and bonds to pay operating expenses are a terrible idea. I wouldn’t call fixing a road an ‘operating expense’. I mean it will be fixed for the duration of the bond. good luck getting 66% of Contra Costa county to vote for a gas tax. Hell I doubt Alameda would. We can’t have nice things like that. Fixing roads is pretty clearly an operating expense. If you can’t pay for the repairs out of your steady-state tax receipts, what makes you think you can instead pay the principle and interest on a bond for the repairs? It only makes sense if you think that road repairs are behind schedule, that you _could_ pay the repairs in a steady state if they were not behind schedule, and that you have no other _capital_ expenditures (schools etc) you’d rather use the cheap money to build. When there’s a vote for a bond it is a vote to both issue a bond and also a property tax to pay for the bond. It’s a tax hike. It’s an important tool that local governments have to raise funds. I’m not even sure it’s possible to raise a new property tax and use that money directly. California, eh? Have you reported those via http://www.SeeClickFix.com yet? The city is very responsive to pavement issues reported there, I’ve had hundreds of potholes addressed this way, often just within days of reporting them. I don’t recall the exact location. I will have to scout it out on my way home. I barely survived, and that was after barely surviving the new bike lane on Broadway. It’s about time! Telegraph has been a dangerous sea of line-less pavement for months. If one did see the very thin white lines that had been sketched out, they would have most likely been killed by cars that just drove down the street whichever way they wanted anyway. I know the spot you are talking about, southbound Telegraph just before 41st Street. I will try making a report myself on my way home tonight. I’ve had good experiences so far with the uphill bike lane there, but yes I raised those exact concerns about the downhill lane when this project was brought to the Oakland bike/ped committee several years ago. I felt an uphill buffered bike lane and downhill shared lane was the best configuration (though in more congested/urban environments I typically oppose sharrows). Staff decided to implement the lane anyway, citing that they thought most experienced bicyclists would be moving fast and riding outside of the bike lane there regardless, but slower cyclists and kids would likely still need a bike lane. As for the street sweeping, that’s another good issue to report via SeeClickFix along with photos. Some other community members have had luck getting Grizzly Peak Blvd swept more regularly, so there’s probably a similar opportunity for upper Broadway. You can raise taxes – but if it’s for a specific use you need 2/3rd to pass. Protected Bike Lanes? Someone is apparently uninformed about the difference between a Bike Lane, Class II Bikeway buffered or not with paint on pavement, and a Separated Bikeway, Class IV Bikeway separated by some barrier from motor vehicle traffic. There is no such facility in California as a Protected Bike Lane. Why should you care? People bicycling are required to use Bike Lanes where they exist – though with some exceptions, see CVC 21208. These new to California and the USA types of bikeways, popularly known as Cycletracks but officially titled Separated Bikeways or Class IVs, are being tried out to provide more comfort and to encourage new riders, BUT we are not required to use these Separated Bike ways if we find the shared roadway to be better for our bicycling. Since we are required to use Bike Lanes and not required to use the Separated Bikeways, it’s going to be useful for people – motorists, bicyclists, and law enforcement – to understand the difference. There is a credibility issue however. If there is a bike lane there and you choose to not use it, then it might appear to the general public that the bike lane isn’t necessary at all. Or that if bikes can use the car lane then cars can use the bike lane. And neither of those outcomes are positive. A bike lane usually takes 4 to 5 feet, so that is up to 10 feet of the available width of a street. The minimum street width for access for fire trucks is 20 feet. So it follows that 2-way bike lanes can take as much as 20% of the available street width for a 3% modal share. Taking even more than that might strike a reasonable person as a tad greedy, you know? First, there shall be no two-way bike lanes. There may however be two way Separated Bikeways, Class IV. Second, what is your point? Should we acquiesce to being prohibited from using an adjacent roadway when/if we find the Separated Bikeway to be crowded, slow, or not as convenient? The effort to shift travel mode share from motor vehicles to bicycling will succeed best if better bicycling travel accommodations are available; not by being segregated onto second class facilities. I do not want us to give up on having choice; we currently have the right to use most all roadways though restricted by CVC 21202 and 21208. We – people who would use bicycles – would give this up at our peril. Class IV facilities appear to provide for comfort and a feeling of safety, but this is not assured. And, bicycling travel in Class IV facilities will be slower than that usually available on adjacent shared roadways. Build them where there is will and funding; children and others may be more likely to use a bicycle for some trips when these are available. Do not let us lose what roadway access we now have by not caring, please. You are over-thinking everything. By 2-way bike lane I just mean a bike lane in either direction on a 2-way street. The percentage width it takes would be the same either way. And if you are given your own dedicated lane then you should use it. If you require that of cars and buses, then why not bikes? Unless you have to turn or pass an obstruction anyway. It’s a matter of perception. There is no over-riding effort to shift travel mode share. The imperative is to give people what they want and not to manipulate them into changing. The people come first, remember? If you don’t want politicians to give the majority what they want, then what should politicians do? In any event there is no Bay Area jurisdiction that could put such a measure on the ballot. There are nine separate counties and dozens of cities. So what would happen is that SF and Berkeley might vote for a special gas tax, but everywhere else would not, and nobody would buy gas in SF or Berkeley any more. Are you guys for real? Think there isn’t already a gas tax to pay for roadways? There are almost 38 cents worth of extra taxes built into a gallon of gas. It might be 39 cents now. Look on the dispenser next time you fill up. THEN on top of that TAX, they add the STATE SALES TAX. So, when gas prices fall, so do the monies that pile into public agencies. There is already fixed taxes on gasoline BEFORE sales tax. No, but the gas tax monies are being used in the General Fund. Gas paying for the roads is pure fiction. It isn’t even true at the Federal level anymore either, since Congress and POTUS refuse to raise the gas tax for YEARS and inflation has taken its toll. 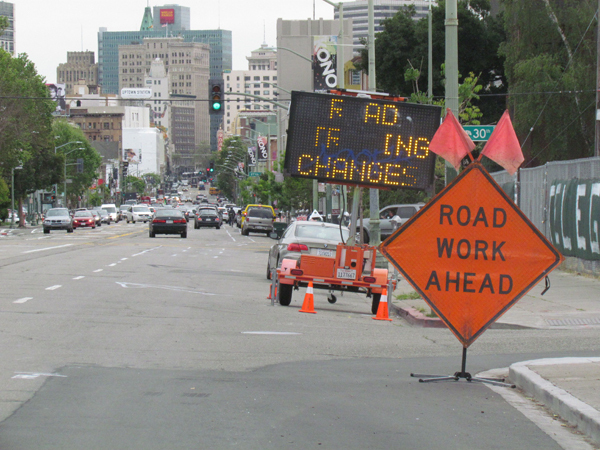 Locally see Oakland proposing a bond (aka property tax) to fix pot holes in November. There are plenty of multi-county agencies in the Bay. See the San Francisco Bay Restoration Authority which has a tax proposed on the June ballot. So if there was the political will to raise a Bay Area gas tax, I doubt the details wouldn’t be that hard to work out. You see that 39 cents on each gallon of gas is applied to the retail price of gas before the state taxes the gasoline with their ever increasing sales tax, right? What part of that do you not get. The reason the money isn’t being used for what it is supposed to be used for – one of which is repairing roads – is because it is used for other items in the General Funds of the different money collectors. The sales tax has been rising and falling with the price of gas for decades. The taxing of gasoline by state ON TOP OF THE gasoline taxes makes the state take even greater. They get 8.5% or whatever county’s rate you live in on the price of the gas plus the almost 40 cents a gallon. That seems incredibly wrong, yet, that is how taxes are calculated. Google and learn about gas tax. Even the nominal amount of 1 or 2 cents designated for cleaning gasoline contaminated sites is going to be hijacked. But I think at least it will be hijacked to fix the roads. No matter how you do your math to sum up how much money comes in from gas taxes, the flat out truth is that it’s not enough to pay for the roadways. When the stimulus was passed the country was littered with signs about road construction projects being paid for by the ARRA. Zero percent of those pork barrel road projects money came from the gas tax. Zero. Yes. Next, we need to do all of telegraph! So much of our bicycle infrastructure randomly ends, making it difficult to figure out how to bike anywhere we’re not familiar with. We need more protected bike lanes, they need to be connected as complete routes so that biking as a means of transportation can become viable for everybody. It is not enough to pay for the roads, it’s true. But then there is no reason why it should be. Roads are essential infrastructure and so should be at least partly paid from general funds, because everyone benefits from roads and not just those who drive private cars on them. We could debate what the split should be, and no doubt we’d reach different answers. But the idea that gas should be at whatever price it takes so that non-drivers pay zero isn’t going to fly. If you want to know how much tax there is on a gallon of gas, look at gas prices in places like Kuwait, where gas is under a dollar a gallon. Most of the cost of a gallon of gas is either direct taxes or extra costs as the result of government regulations. Since everyone has an interest in pot-holes being fixed, why do you not want everyone to pay for that? I agree the city doesn’t spend enough on fixing the streets. But that is not because taxes are too low, but because their spending priorities are all wrong (e.g. $200 million a year sprayed at the homeless). Kuwait subsidizes gas – but you know that. Your analysis misses – and you know this – the fact that if we paid for roads completely through user fees – then those who benefit but don’t drive WILL contribute. If I buy beer that is shipped in a truck, and the truck’s gas costs go up via gas taxes, they will pass the cost on to me. And I’ll have the money because my other taxes are lowered. This has all sorts of positive impacts, in that by internalizing shipping costs, efficiency is added to the market as people may choose options that require less shipping. This was true briefly during the recession when the gas taxes were raided to cover general fund expenditures, but this has since been reverted as hasn’t been relevant for some time now. A very small amount of gas tax monies does still flow into the general fund, but it is not significant. The reality is that driving user fees (gas taxes, registrations, tolls, etc) doesn’t get anywhere near covering even the direct expense cars and trucks impose, let alone the externalities. California is one of the worst states in the county in this regard, with less than 35% of user fees paying for freeways, streets and roads, while the national average is around 50%. Yes, but people who drive more benefit more, and thus should pay more to cover the cost they are imposing via their personal trips, as opposed to expecting everyone else to subsidize their driving. The current split in California, which involves only 35% user fees paying for streets and roads, shifts the cost burden away from people who drive the most, which results in overuse of automobiles and unsustainable land use decisions as a consequence of this overuse. People simply can’t make smart choices about transportation while we continue to artificially underprice and hide the actual cost of driving to such an extreme. 1) Elastic prices – that the market will bear the extra cost. What happens when it won’t? 2) You pay for every single instance where you benefit from roads, such as riding your bike, taking a bus, having SFFD rush to your house to put out a fire. And that isn’t the case right now. Your 35% number,, if true, is interesting. But it still begs the question of what the correct number is. You imply that a 35% figure for user fees is too low. But then user fees are highly regressive, hitting the poor much more than the rich. Some might argue that is unfair, promotes further inequality, and that more should be taken from general funds to alleviate that. Reasonable people can disagree about what the private versus public percentages should be. 35/65 doesn’t strike me as that out of whack. No, wealthier people are far more likely to drive more miles, and less wealthy people are far more likely to use transit, bike, or walk for transportation. To NOT tax driving enough and expect others to cover the difference is the truly regressive policy, such as via all of the sales taxes and other non-user fees which are currently going to roadway projects. We don’t have to debate what the correct split of user/general funding there needs to be for streets and roads. Just calculate what the cost is each user is imposing on the system via a vehicle miles traveled fee, and then impose that plus a gas tax on top to account for the environmental cost as well. You are the first person I’ve ever heard say that a 65% subsidy on driving is not “out of whack”. If you ask around most people will say they think that the fees they pay either cover their driving 100%, or at least very close to this. Nobody has a clue how much cost their driving imposes on society, so we need to put those costs up front for the user to see and take responsibility for if we have any hope of people making reasonable transportation decisions. That’s a feature, not a bug. If someone is willing to pay $10 for a widget, but they are actually paying 10 for the widget and 2 to subsidize the widget getting to them, they are overpaying for the widget and don’t know it. Better to lower their general tax burden by 2, charge 12 for the widget, and let economics work without the distortions. Please cite where you are getting this info. Thanks. Also, where is the sales tax (state) money going from each gallon. I get the externalities. Finally someone with an econ background. The uphill bike lane makes good sense. The downhill one doesn’t, since I’m going to be reaching a high speed on my bicycle and don’t need to be diverted into the gutter. Also it’s a 12-foot-wide lane with no parking on that side so really there’s more than enough room for everybody.